Ohio State: What does future hold for Kaleb Wesson with Buckeyes? Columbus – Kaleb Wesson delivered a classic performance as Ohio State donned throwback uniforms in its venerable old home, sold-out St. John Arena. The Buckeyes sophomore oftentimes dominated both ends of the floor, and No. 23 OSU maintained its perfect start to the 2018-19 season as second-year coach Chris Holtmann moved to 31-9 through his first 40 games atop the program in an 89-62 win against visiting Cleveland State. We take a closer look at the Buckeyes’ latest double-digit win, a game in which they were never tied nor trailed, in continuing our “Three Points” from Friday’s win in the Buckeye Classic. Ohio State held a 22-point lead. The game was not remotely in doubt, and it had not been for quite some time. Plus, Keyshawn Woods is the one-year guy; a graduate transfer at his third college just assembling into the lineup. Yet here was Woods with a fabulous hustle play that embodied this team through one-fifth of its season. As the Buckeyes’ defense tried to cut off a Cleveland State offensive pass, the ball careened toward the corner and nearly out of bounds. Here came Woods, hustling from near the baseline and seizing the ball in the corner before firing it off of Stefan Kenic to keep possession with the Buckeyes. Not long thereafter, the lead ballooned to 30 points. The plan was more than just a possession, however. It showed this team is continuing to take on the identity Holtmann wants to see and why the Buckeyes are among the early-season surprises in college basketball. After some shooting struggles in the previous three outings, senior C.J. Jackson appears back in a groove on the heels of his work against Cleveland State. Jackson connected on a pair of early triples to give him 100 for his career, and he closed with 17 points on 7-for-10 shooting, including three of four from 3-point, as he led the Buckeyes’ backcourt scoring. Jackson’s early effectiveness formed a lethal combo for the Buckeyes with Kaleb Wesson doing work both inside and outside against the Vikings. Kaleb Wesson had a team-best 19 points, snared six boards, four steals and also handed off three assists. It was a fabulously complete game for the sophomore post and showed how much easier life can be for all the other Buckeyes when the Jackson-Wesson combo clicks together. Ohio State continues to be one of the best-shooting teams in the Big Ten and really in all of college hoops. The Buckeyes burned the Vikings for 53-percent shooting (34 of 64) and hit 37 percent of their threes (7 of 19) and 74 percent of their free throws (14-for-19). They’re now shooting 51 percent from the field through six games at 165-for-325. 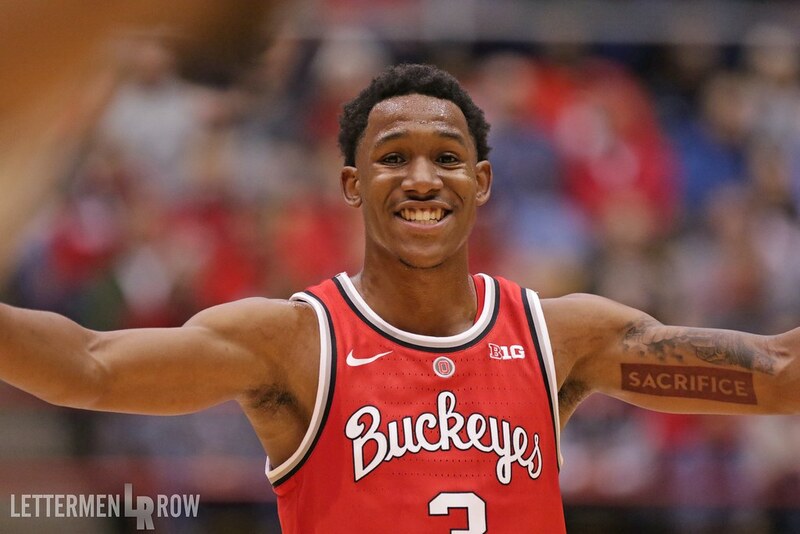 While Jackson and the younger Wesson brother did the heavy offensive lifting on this night, they were not the only key contributors as a dozen Buckeyes dented the scoring column. Andre Wesson added 11, and freshman Luther Muhammad continued to quickly come of age with 10 points, three boards, two assists and another turnover-free outing in 25 minutes of floor time. Kyle Young might be the undisputed glue guy with another gritty effort, posting eight points and three rebounds in just 16 minutes. After shooting poorly a year ago from the free-throw line, Young continued to show impressive improvement at the stripe against the Vikings; he’s 8-for-12 on the young season after shooting less than 50 percent on freebies last season. Photos from Ohio State and Cleveland State. Hover over the first image, then use your left-right arrows to view photos. With more than 20 years’ experience, John Brice is an award-winning journalist and former sideline reporter who primarily has covered SEC athletics, including a lengthy stint on the University of Tennessee beat.